Did You Check First? : What and With Whom is the Tea Party So Upset? So what exactly is everyone - especially those in the Tea Party - so upset about, why, and with whom? Could it be they actually don't know the facts, or is it that they simply choose to "refudiate" and ignore those facts? Now, if you're among the RWMFs the story is admittedly a little different. As I'm sure all you RWMFs know, the marginal tax rates for the Twice-Median Income Earners climbed from 22% in 1967 to a peak of 43% in 1980. The Dems controlled Congress during this period. The White House was occupied by the LBJ, Nixon, Ford and Carter administrations. 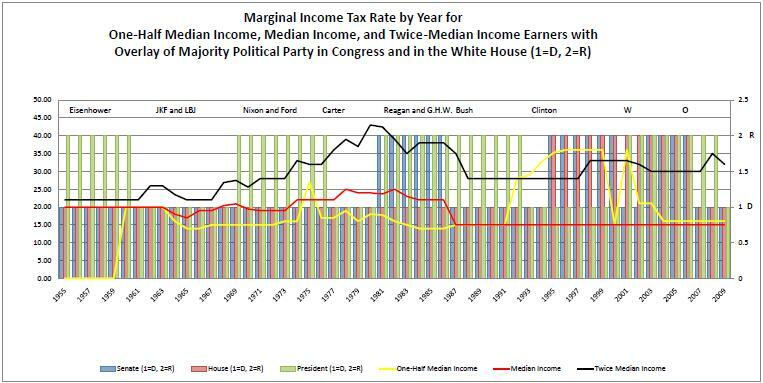 The GOP took back the Senate and White House in 1980 and tax rates start declining but primarily for the rich. Hooray. 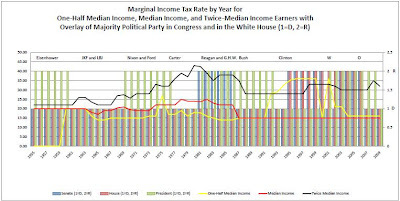 Tax rates declined even more vigorously when the Dems took back the Senate in '87 and once again controlled both Houses. Let me say that again. All you have to do is look at the chart above and the Tax Policy Center's data and do the math yourself if you don't trust me. And why was our debt rising? Could it have been because of increases in defense spending (here and here) while at the same time the taxes being paid into the Treasury were being cut perhaps? No. Couldn't be. Could it? Really. What do I know, and what do the facts prove? Nothing, right? They are easily "refudiated". And who was it who increased taxes on the wealthy Twice-Median Income earners? Was it those evil Dems? No. It was a GOP-controlled Congress who increased those taxes in 1998 from 28% to 33%. Look at the chart and the data. The facts don't lie. Yes, the Democratically controlled Congress increased them in 2008 - an act for which they win my admiration - but they also reduced them in 2009. Curiously enough marginal rates on low income earners have bounced around. They are now just a little higher than middle income earners. Evidence, IMHO, that the less money you have the less power you have in this country. You do get to be a political football, though, if you're poor. Unfunded tax cuts mean simply this: you can't reduce taxes without appreciating that those reductions mean less income to the government. Unless you replace it with some other source of funding, the deficit gets bigger. If you cut that income source by cutting taxes but still care about trying to balance the budget, then those cuts must be balanced - funded, if you will - by some combination of increases in income (taxes) elsewhere and/or cuts in expenditures. Considering what I think is plenty of proof about our slide into mediocrity and mendacity manifest in so many ways by the Tea Party movement, I guess I'm not all that surprised that so many people are so upset without even understanding why. Here's the reality. The GOP is lying, plain and simple, and Tea Partiers seem completely uninformed about the facts. When the GOP says that Bush's tax cuts didn't increase the deficit and were good for the economy and so should be extended and don't need to be "funded" they are lying. Either that, or they believe there really are free lunches in this world. And the GOP and tea partiers have the balls to whine and cry and stomp their feet about extending unemployment benefits??? Their demand that extending unemployment must be paid for while it's ok to extend tax breaks to the wealthy without funding is both asinine and heartless. What I'm saying - again - is that we can't have it both ways. If you want to debate facts, let's do that. If you want to present real data, then I implore you to please do so. If any tea partiers out there can explain and defend their anger with this administration with anything even resembling data and facts, I might actually pay money for that. Otherwise, I remain steadfast in my conclusions that unless one counts themselves among the wealthiest 5% - maybe 10% - in this country it remains simply and utterly inexplicable to me as to how or why the GOP or Tea Party holds any attraction to anyone but the wealthiest among us.....................unless, of course, you choose to ignore the facts. Special Comment: Teabaggers and Racisim.